Every stage of your child’s development will come with its own unique challenges, as they grow up and develop new emotions and cognitive capacities. However, one stage in development can be particularly worrying for parents – the teenage stage, a time of incredible growth and physical change that, even if we can still vaguely remember what it’s like to be one, is frightening to be on the parenting end of! Understanding how teenagers think is important to helping reduce your anxiety and stress about their development. Here are some key notes about your growing teenage child, and some signs to watch out for. Early on in your teen’s development, you might notice them withdrawing and isolating themselves. They may be closing and locking their doors more often, and say phrases like “Leave me alone” or “It’s my life!” when challenging your authority. These and other individualistic behaviors are the manifestation of what is known as the separation-individuation stage, in which a teen wants to develop their own identity and experience independence. While they might be distressing to you, who’d probably be used to a cherished sweetheart for whom you had plenty of specific hopes and dreams, the reality is that this stage is what will eventually allow your child to grow and become responsible. It can be tempting to respond to this stage by pushing back against their self-expression especially when it involves interests and behavior that you don’t approve of or understand. However, this critical stage is best approached by taking the time to understand your teenager’s needs, friends, objectives, however different they might be from what you had “planned” for them. Indeed, having plans for your child that don’t consider their own desires can have detrimental effects on your relationship, and their development! At the same time, though, your child may also experience what is known as necessary regression, in which they unpredictably relax and experience intense childhood drives that require fulfillment of attention. This emotional yoyo must be accepted by parents even if it’s difficult – non-acceptance can only lead to resentment and further difficulty. Not all drastic and rapid developments in your teen are expected and should be left alone, and it can be hard to tell things apart. Teenagers are susceptible to depression, stress, anxiety, and other negative feelings, and a variety of issues can lead them to destructive behavior that they inflict on themselves. Addiction, self-esteem issues, even wanting to quit school – these are all signs that something is toxic in their lives. Understanding of an adolescent first and foremost begins with seeing them as a person with their own legitimate concerns and difficulties that may not be comparable to your own experiences. IT’s never good to dismiss what they feel, and assurance that “This will pass” isn’t going to be very helpful when they might not necessarily see the light at the end of the tunnel yet. You must communicate with your child and position yourself as a parent who is willing to listen to what they have to say. While you could never fully address or predict every possible issue your child could potentially have, the best thing you can do is to provide them with a nurturing environment that will assure them that their family has their back. The school also plays an important role here. 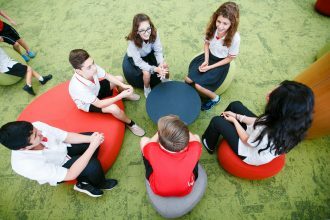 Swiss International School in Dubai aims to provide a pastoral care environment for our students, giving them room for growth and to explore their own individuality, while serving as a place they can turn to when the going gets tough. Our team of counselors, boarding school staff, and every teacher plays a part in the process of development.